Home / News / Not again! Woman jumps into lagoon in Lagos!!! Not again! Woman jumps into lagoon in Lagos!!! While the dust raised by the action of Allwell Orji, a medical doctor, is yet to settle down, another suicide attempt has been recorded in Lagos state. According to NAN, after the incident of Orji. 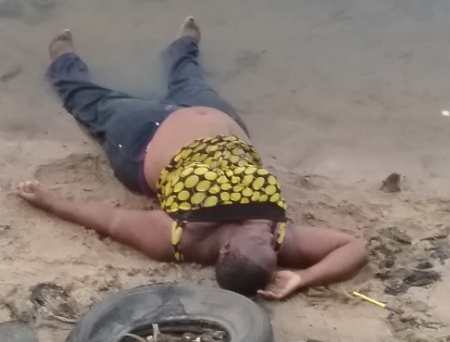 NAN quoted witnesses as saying a middle-aged woman jumped into the lagoon in Maza-Maza around the Mile Two area of the state. The woman who wore a blouse and trousers, had been walking aimlessly to the Maza-Maza bridge in the Mile Two area, until she got to the middle of the bridge, and to the shock of everyone, climbed the rail and dived into the lagoon. The woman was, however, rescued following the timely intervention of local fishermen and divers in the area. May God continuously protect us, Amen!